MobileSputnik turns iPad and Android tablets into the true Enterprise Mobile Workplace, giving users familiar PC capabilities and providing rich functionality, usability and security while working with corporate files (PC sync folders, Windows shared folders and SharePoint libraries) at any time in any place. MobileSputnik opens up easy and secure access to corporate information assets with on-premises deployment and smooth integration into an existing enterprise IT and information security landscape. Designed with the tablet user experience first in mind it provides unique features and supports habitual PC scenarios for using mobile devices in a business environment. 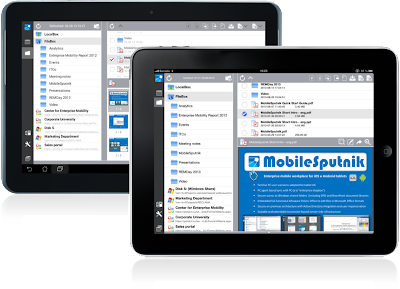 MobileSputnik provides a rich toolset for document access, viewing, creating, editing, sharing and management directly on modern tablets by using embedded in-app office (Polaris Office by Infraware). MobileSputnik Server provides a secure and scalable enterprise file exchange infrastructure for on-premises deployment within the enterprise landscape. The server is designed with a special focus on enterprise level security with multi-level authorization of users and their devices with Active Directory and other enterprise grade capabilities.